Dreams Casino is an online casino including mobile games, established in 2004 using games powered by RTG software. It is operated by Wisol International and is licensed under the jurisdictions of Costa Rica. Dreams Casino is an instant play and downloadable online casino, where dreams come true. They use at least two software providers and also offer an option to play some of the games on the player’s mobile device. Players can play for free on their website or they can download the entire casino to their computer; either option is available without ever depositing any money. They offer a variety of games, so there is sure to be something for every type of player. In addition to more traditional games like slots and poker, Dreams Casino also offers unique features like Live Dealers and slot tournaments. They even add new games every month, so when players get tired of current games, they can try out new ones. Dreams Casino has a welcome bonus of up to $2,000 when players first sign up. They will match the gambler’s first deposit by 200%, up to $2,000. 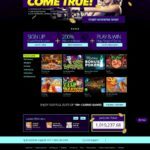 They also give free spins for specific games. For example, the current promotion is for 25 free spins in Beaver Builder. They advertise that these free spins have a $25 value. They also have a redeposit bonus that features matching up to 200% as well. The redemption coupons for these promotions are listed on the online casino’s website. Dreams Casino also has a VIP program in addition to their great regular deposit bonuses. VIPs get a 250% redeposit bonus, which includes a 30% deposit insurance. VIP members also have the chance to get extra chances to win on their deposits. If the player does not win on the first try of their deposited funds, then they also get a second chance to win with every deposit. VIPs also get higher monthly insurance credits, higher limits on free chips, and bigger bonuses. VIP members get an extra $100 in free chips every week as long as they have made a deposit in the past seven days. Other than the seven-day deposit requirement, there are no additional deposits required. There are five levels of VIP benefits, and maximum benefits increase at each level. Speak with support staff to become a VIP member. The software used for Dreams Casino is provided by Global Gaming Labs and RTG. Once the player downloads the software from Dreams Casino, they must register with the online casino by providing their current and valid personal information, including withdrawal and deposit information. This online casino will usually download in less than ten minutes, even if the player is using a simple 54k Modem. However, the software is not compatible with Macintosh operating systems, but these players can still play via the instant play option on the online casino’s website. Dreams Casino uses the industry standard 128-bit encryption technology to ensure that the user’s personal information is kept completely confidential. They never give out personal information to third parties. Dreams Casino’s transactions processors have been carefully chosen to ensure that the player’s bank information or credit or debit card information is secure as well. These processors also use encryption to keep payment information safe from third parties. Even a player’s winnings are not reported to any third parties. However, this online casino will use personal information if the casino suspects that there is fraud. Like many online casinos, they reserve the right to investigate deposits, withdrawals, and other personal information in order to combat and prevent any further fraud. Dreams Casino has over 150 different types of online casino games. 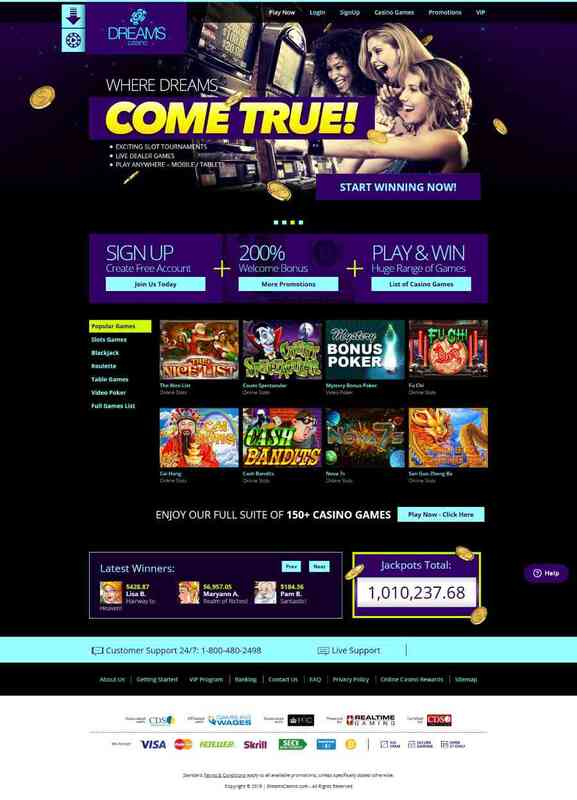 Users can download all of the games or play specific games on the casino’s website. Many games are available using either option, but the download has more games available than the instant play option. There are also a few games available for the mobile phone or another device as well. Most of the games are video slot games, and they include popular slot games like Triple Twister, Football Frenzy, Rain Dance, High Fashion, and Voodoo Magic. They also have new slot games like Wild Wizards and The Naughty list. Traditional 3-reel slots are also available. The slots often have progressive jackpots and multi-line play. Dreams Casino also has a variety of more traditional table games such as Texas Hold’em Bonus Poker, Pai Gow Poker, War, and Red Dog. Twenty-one games like Blackjack and Match Play 21 are also available. There are several different types of Video Poker games as well, including favorites like Jacks or Better, Deuces Wild, and Joker Poker. However, Video Poker games are not available on the user’s mobile device. Dreams Casino also has some specialty games like French Roulette, Craps, Keno, Lucky 8’s, European Roulette, and American Roulette. Dreams Casino offers online, live support and a telephone number to reach customer service. They also provide several e-mails for a variety of potential customer service questions, including support, accounts, promotions, management, and withdrawals. A fax number is also available. There are several phone numbers, many of which are toll-free, and may vary depending on the player’s location. A separate line is available for deposits as well. Support staff is available 24 hours a day, 7 days a week, so they are never far if the player has a question or concern. Those who are in the VIP program will be assigned their own support person who will answer any questions or deal with any other issues that arise.